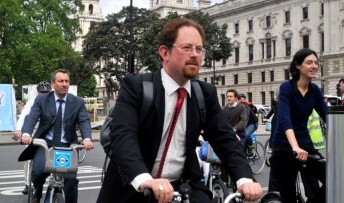 A landmark report on the future of cycling in Britain led by Cambridge MP Julian Huppert calls for a national cycling champion to lead a drive for 10 per cent of all journeys in Britain to be by bike by 2025. More of the transport budget should be spent on supporting cycling, at an initial rate of at least £10 per person per year, increasing as cycle levels increase, says the report by British Parliamentarians. The report of the influential All-Party Parliamentary Cycling Group inquiry ‘Get Britain Cycling’ also calls for 20mph speed limits to become standard in urban areas and lower speed limits on many rural roads. It also says that all children should be given the chance to learn the skills of road cycling, at primary and secondary school. Julian Huppert, MP for Cambridge and Co-Chair of the group, said: “This generation of politicians has the chance to be long remembered for having a vision for cycling that includes us all. Put simply, Britain needs to re-learn how to cycle. This report sets out how this can be done. “Cycling has huge advantages – it is fast, safe, healthy, efficient, reliable, environmentally sound, and fun. We all benefit when people choose to cycle. The group’s report, published today (24 April) follows extensive public evidence from over 100 individuals and organisations, including cycling organisations, the Automobile Association, and a wide range of government departments and ministers. It is both possible and necessary to expand the role of cycling in the nation’s transport and social life, says the group. This will lead to reduced congestion, environmental benefits and healthier citizens. The aim is increase cycle use from less than 2 per cent of journeys in 2011, to 10 per cent of all journeys in 2025, and 25 per cent by 2050. For this to happen, leadership is needed right from the top, the MPs and Peers conclude. They call on the Government to appoint a National Cycling Champion to advocate for cycling across all departments and externally. The President of the Automobile Association, Edmund King, said “If the recommendations in Get Britain Cycling are followed through it should be the catalyst for change to put cycling on the front foot. The clear vision is to change cycling from a ‘minority sport’ to a mainstream mode of travel. I’ve signed the petition and I’ve blogged about it (http://energy-surprises.blogspot.com/2013/04/a-chance-to-promote-cycling-in-uk.html) – but I would have liked to include a link to the report and the list of recommendations. Where is it? I can’t find a link to it anywhere.